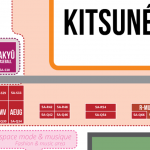 The AEUG is taking part in the 16h edition of Japan Expo, from July 2 to 5 at the Parc des expositions de Paris-Nord Villepinte. 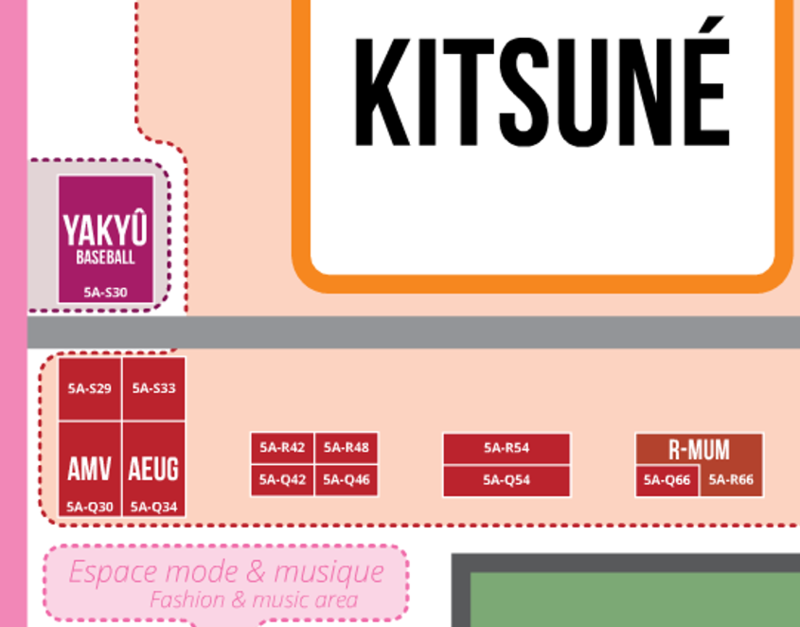 You can find us on the booth 5A-Q34, next to the Yakyû area and near the Kitsuné stage. You can find our whole schedule (available in French only) for this event, filled with Gundam quizzes, dubbing and karaoke sessions, an all-event-long Gunpla building workshop, etc. 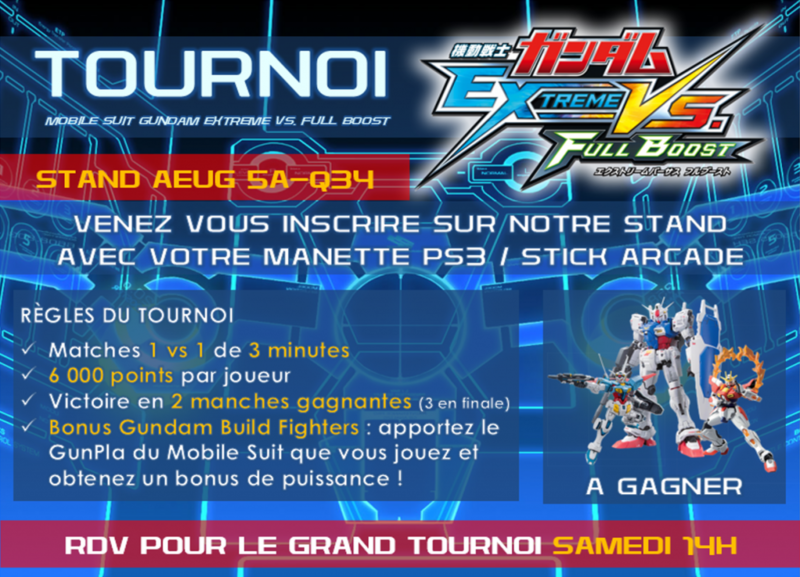 Do not forget our main event: our annual Mobile Suit Gundam Extreme Versus Full Boost tournament! It starts on Saturday 2PM, and player who come with the GunPla of the suit they use in the game will get a power-up! To be aware of all the happenings of the AEUG during this event, you can follow us on Twitter. Free GunPla workshop (limited number of kits for the whole week-end) on the AEUG’s booth. GunPla painting and kitbashing demo on the AEUG’s booth. Panel “History and technological improvement of Gundam model kits”, on saturday 3:00 PM in room MORGOTH. Panel “The mysterious man in the Gundam franchise: a villain behind the mask?”, on sunday 5:30PM in room THANOS. Please drop by our booth! 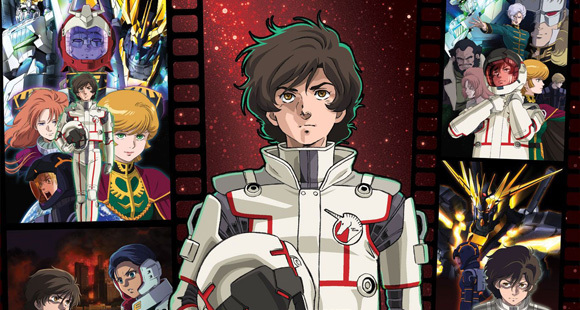 For the first time in France, a Gundam series will be simulcasted: “Gundam: Reconguista in G” available on WAKANIM.TV (French only)! 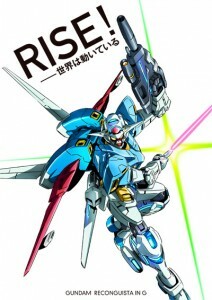 For the first time in 15 years (the broadcast of Turn A Gundam), the creator of the franchise, Yoshiyuki Tomino, comes back to direct a Gundam series. On this show, he also gathered Ken’Ichi Yoshida (Eureka Seven) and Akira Yasuda (Turn A Gundam, Overman King Gainer) around him. 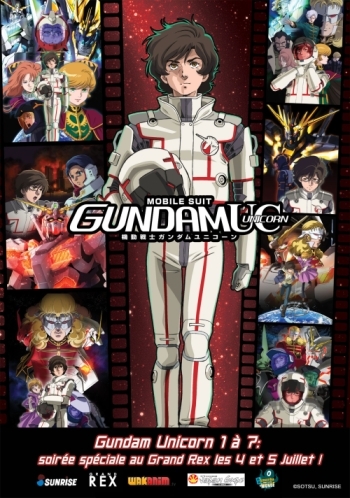 People in French speaking countries will be able to watch “Gundam: Reconguista in G” on WAKANIM.TV starting on october. WAKANIM.TV provides episodes in full HD, with French subtitles and for free for one month. It is a unique occasion for French speaking Gundam fans and other people who want to know more about the Gundam franchise! 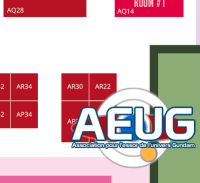 The AEUG is taking part in the 15h edition of Japan Expo , from July 2 to 6 at the Parc des expositions de Paris-Nord Villepinte. You can find us on the booth AP22, right behind the inner garden. The Mobile Suit Gundam UC (Unicorn) screening at the Grand Rex in Paris, on Friday and Saturday night. Each day, you can follow the convoy departing from Japan Expo to go to the Grand Rex. The grand Mobile Suit Gundam Extreme Versus Full Boost tournament, starting Saturday 2 PM on the AEUG’s booth. Don’t forget to bring your PS3 controller and the GunPla of the Mobile Suit you play in game, you will get its stats boosted! To be aware of all the happenings of the AEUG, follow us on Twitter. From the inception of the project, Mobile Suit Gundam UC has consistently seen a simultaneous worldwide release. For the concluding episode 7, with the desire to convey the ideas it contains to as many people as possible, screenings and events will be held throughout the world under the name of “A Message to the World.” Let’s share the final message of this story, which has continued for five years, with everyone in the world! The European step of “A Message to the World” Project comes to Paris, at the famous theater Le Grand Rex, on July 4 and 5. More information here (in French). In the occasion of this exceptional event for Gundam fans, you can win 5 tickets for the screenings (courtesy of Wakanim) and 5 GunPla offered by the AEUG! The 5 tickets will be offered to 5 people drawn among the ones who answered this quiz correctly. Let’s meet on July 4 and 5 for this thrilling Gundam experience!